Elegant raw bars chock-full of fresh oysters are ubiquitous in this town; the city’s proximity to the Chesapeake Bay provides us with some of the richest, most buttery oysters on the east coast. But feasting on these local treats can get expensive, given that some places charge anywhere from $2 to more than $3 a pop… which doesn't sound too bad, until you remember that you're, you know, ordering them by the dozen. 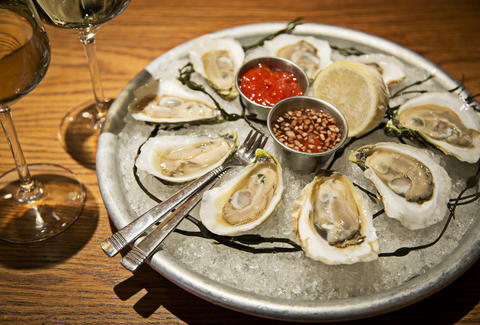 Luckily, some of DC's finest oysters get seriously discounted at happy hour. You just have to know where to look. We rounded up the very best happy hours in some of DC’s most popular neighborhoods, so oyster night doesn't have to fall on payday. It’s hard to keep a secret in a neighborhood as busy as Georgetown, but Sea Catch -- and its old-school DC vibe -- has managed to stay under the radar for decades. The restaurant offers $1 raw oysters and half-priced drinks at the bar during happy hour, which runs Monday through Friday from 5 to 7pm. This is the place to be for anyone looking to enjoy some oysters in a smart setting where it’s easy to have a conversation without shouting -- not the easiest quality to find in DC restaurants these days. 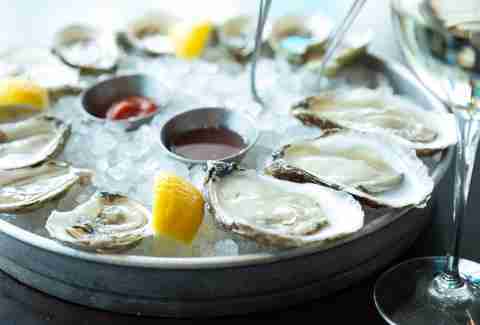 Located above Pearl Dive Oyster Palace, Black Jack offers two-for-one oysters during happy hour, and they’re some of the freshest around -- all you'll want, dressing-wise, is a squeeze of lemon. Plus, there's an indoor bocce court, so once you fill up on half-priced bivalves, you can grab an Abita and hit the games. Don’t overlook Urbana for raw bar specials -- happy hour at this chic hotel bar inside the Hotel Palomar offers $1 oysters along with a menu of other Italian snacks and drinks, like $7 cocktails and $8 grilled calamari. So grab an Aperol spritz and get to it. 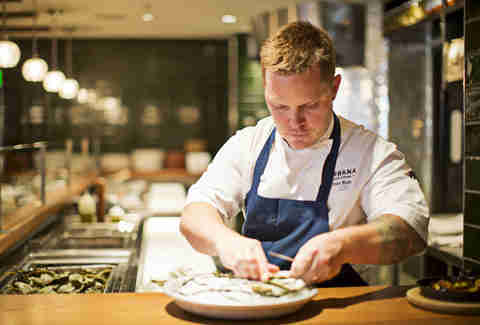 Mixologist Derek Brown’s heavy metal-tinged raw bar recently launched a "Brine Time" happy hour, featuring savory and salty cocktails for $9 a pop, paired with buttery Rappahannock River Oysters for $1 each. Specials run Monday through Saturday from 5-7pm, and all day Sunday. 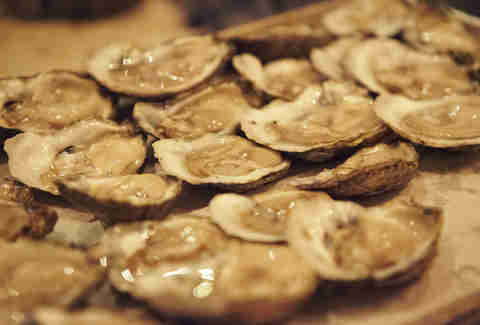 We'd recommend going for an "oyster back" -- an oyster, a shot of rye, and pickle brine, $6 for the set. Elbow past the lobbyists and lawmakers to grab a spot at the bar, where select oysters are $1.25 each from 3 to 7pm Monday through Saturday, and from 3pm to close on Sundays. Pair these with their $4-5 wine, punch, and beer. Check out their regular menu, too -- especially the lobster roll with Old Bay fries and the New England-style clam chowder. The proximity to Eastern Market and Barracks Row make it a good midday stop, as well. Yes, Old Ebbitt Grill is a huge tourist draw, thanks to its status as the oldest restaurant in the city. That doesn’t mean locals should ignore it -- especially when it comes to fresh oysters and a cold beer. The back bar is a great place to hang out during happy hour, when all oysters are half off, and there are plenty of choose from. There’s always plenty of space, so groups will be happy here. The best part is that the deal runs seven days a week from 3 to 6pm, then again from 11pm to 1am (and 2am on the weekends). The small patio at Pop's is ideal for people watching and a great spot to slurp back a few happy-hour oysters. Select oysters are just $1 Monday through Friday from 3:30 to 6:30pm, as well as from midnight to close Friday and Saturday. Take advantage of $3 Tecate tallboys and $2 Natty Bohs as well... or try an Orange Crush cocktail that will make any Marylander proud. This area of DC is starting to up its restaurant game, and The Grilled Oyster Company in Cathedral Heights is one of the newest additions. During happy hour, snag oysters on the half shell for $1.50 each from 3:30 to 6:45pm (yes, it's pretty oddly specific) from Monday through Friday. Check the restaurant’s chalkboard for daily specials, and try to grab a spot on the sidewalk, which affords great people-watching opportunities. The bar offers tons of wines, local beers, and Bay punch for $5 then, too. Be warned, however: the neighborhood skews a bit toward young families, so don’t go here expecting a buzzy vibe or a kid-free zone. The DC outpost of this Chesapeake Bay oyster operation has happy hour Tuesday through Friday from 4 to 7pm at its bar inside bustling Union Market. 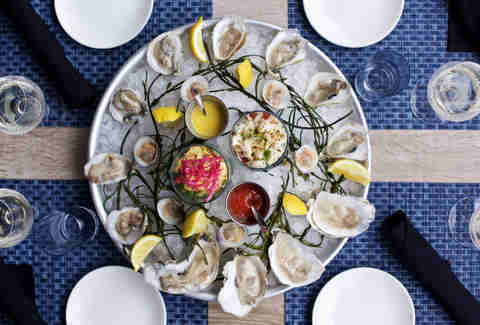 While getting a table can be tough, deals at the sleek bar include half-priced raw oysters and clams, with a minimum order of six. Wash them back with $4 beers and glasses of wine. Evoking the vibes -- as well as the bright blue-and-white decor -- of a classic New England seafood hangout (cocktails include the Fenway Park, the Provincetown, and the HIHOWAYA), All Set is another restaurant offering both regular and late-night happy-hour menus. Oysters are a buck each from 3 to 7pm Monday through Thursday, 3 to 6:30pm Friday and Saturday, and Sunday from 3pm to close. Late-night specials happen from 10 onward on Friday and Saturday. There are cocktails for $5 and a daily punch for $7 a glass.